Overcast. High 81F. Winds SSW at 10 to 20 mph..
Cloudy with occasional showers overnight. Thunder possible. Low near 60F. Winds S at 10 to 20 mph. Chance of rain 60%. The Madison County Fiscal Court honored late Sheriff Cecil “Dude” Cochran during its bi-monthly Tuesday at Berea City Hall Chambers. The court had a moment of silence for Cochran, 86, who died last Friday. Cochran served as Madison County Sheriff from 1982-2007 and remains the longest tenured Sheriff in the county. “I want us to be saddened for the loss in the community and I want us to be saddened for his family, but I also want us to be thankful for the lives that he touched over his years of service for the better of people in this community,” Madison County Judge Executive Reagan Taylor said. 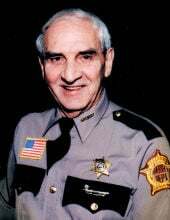 “He was a wonderful Sheriff, a wonderful elected official and a wonderful representative of this county for many, many years. Taylor ordered flags to be flown at half-staff at all county buildings in Cochran’s honor this week. During its regular business session, the court made two re-appointments to its boards and approved 13 new hires, including eight in the EMA/CSEPP division. Mike Eckler of the ethics board and Jill Cornelison on the EMS-Ambulance Board will both continue to serve on their respective boards. The EMA/CSEPP added eight employees — Matthew Reeder, Terry Bratfish, Shane Bradley, Matthew Webb, William “Clay” Caylor, Clinton Divin, Nicholas Cole, Terry Byrd -to its staff. Each will make $16.41 per hour. The Battlefied Golf Course added Aaron Hicks ($8.50) and Ben Robinson ($8.50) to its seasonal grounds crew for the upcoming season. The Madison County Road Department hired Anthony Morrison ($13.20) and Lynn Brewer ($10.50) as seasonal employees. The court went into executive session for more than 45 minutes to discuss a possible purchase of property and a personnel matter. After returning, the court moved to suspend Paul Green of EMA/CSEPP for five days without pay effective immediately. No action was taken on the possible property acquisition. • Entered into an agreement with Johnson Controls for fire alarm and monitoring services at all court buildings on Main Street for $5,540 per year, a savings from previous contracts at $125 per year. Previously, various venders serviced the four buildings. • Heard from citizen Kevin Rankin regarding Mae Stevens Road. Rankin expressed concern over the road that he said needs repaired because of deteriation following recent heavy rains. Madison County Road Supervisor Willie Willis doesn’t think the portion of the road in question is under county jurisdiction. First District Magistrate Larry Combs said the county will be “looking hard at that road” in the future.